Google declares Brazilians world’s best soccer fans based on hard data. 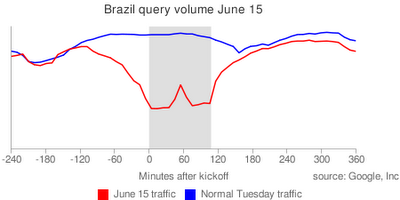 On June 15, as Brazil played its first game against North Korea, the volume of queries from Brazil, shown using a red line, plummeted when the match began, spiked during halftime, fell again and then quickly rose after the match finished. 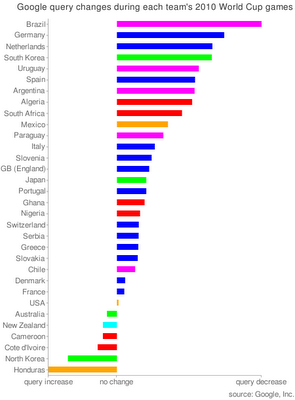 To measure which country has the most loyal fans, we computed the proportional drop in queries during each of its team’s matches compared with normal query volume. Brazil topped the charts with queries from that country dropping by half during its football games. Football powerhouse and third-place winner Germany came in second, followed by the Netherlands and South Korea. This entry was posted in Article review, Brazil, Culture, Life and tagged Brazil, Google, Soccer, sport, World Cup. Bookmark the permalink.